One striking horizon shot is all that’s required. That should be easy right? Not when two of my recent posts have focused on scenic shots from Barcelona’s best vantage points! Missed opportunity for me – Oops! So let’s rewind back to my 2012 travels for this one, and stunning Sairee Beach on Ko Tao, Thailand. 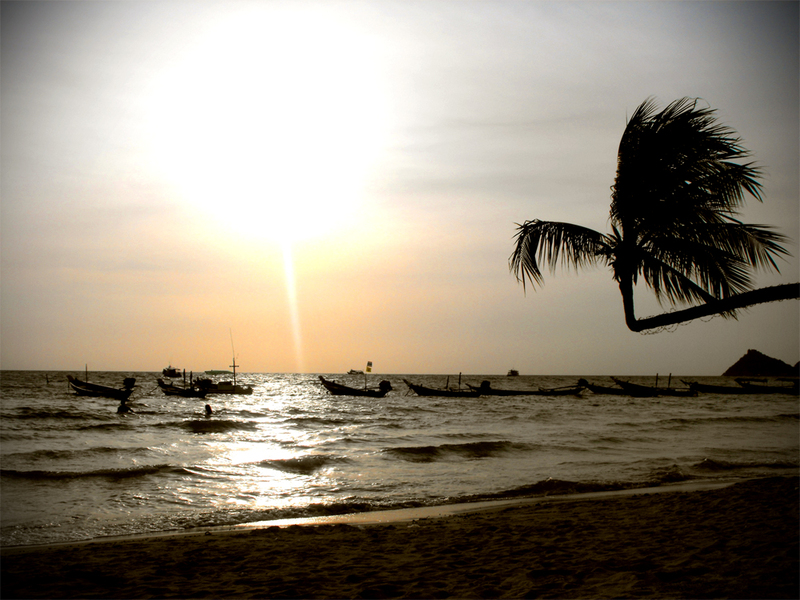 The palm tree and longboats add some typically Thai touches as the sea stretches out far into the horizon. Thanks Janaline. It was a beautiful island too! Great photo Carl! I have an almost similar one taken in Bali.. gotta love the sunsets in Asia 🙂 And btw, kickass website you have right here.. will definitely be reading it more often! Thanks for the kind words too, glad you could check it out! Thanks. I absolutely loved Ko Tao. I’d probably go back to Thailand just to visit that awesome island! I never made it to Ko Tao as we stayed more than a week in Kho Phangan Island, but I can just imagine how stunning Sairee Beach looked like :).